A few weeks ago I found myself mulling over what to do with a head of cabbage and some tomatoes I had on hand that needed to be used. I immediately thought of stuffed cabbage rolls, one of my favorites, but decided that I wanted to create something unique and different. The recipe that follows is what I came up with and I have to give kudos to myself because this dish is absolutely delicious! The first time I made this I used a sherry vinaigrette. Yesterday, however, I thought what a great Irish recipe this could be and decided to use a warm bacon vinaigrette in place of the other vinaigrette to really bring out the Irish flavors. Since I have Irish blood in my veins I thought this would be a great dish to prepare in honor of St. Patrick’s Day, which is exactly what I did! I do want to point out, as you will see, this is not a quick recipe. There is quite a bit of work involved, but much can be done a day ahead…right up to preparing the cabbage rolls, all ready to pop in the oven the next day. I have made note of this in the recipe. 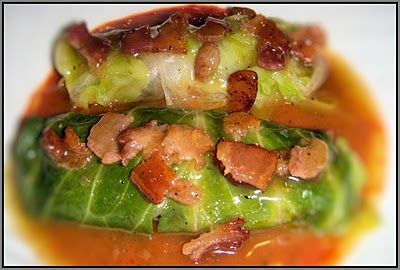 The only dish that needs to be prepared on the day of serving is the warm bacon vinaigrette, which is very easy and quick to prepare and can be done shortly before removing the cabbage rolls from the oven. To roast, take one large, unpeeled head of garlic. Thinly slice and remove the top head of the garlic to slightly expose the cloves. Rub the entire head of the garlic with olive oil and liberally sprinkle with coarse ground kosher salt and black pepper. Wrap in a small square of aluminum foil and place in the oven. Roast in a 400 deg. oven for 40 minutes, remove, and allow to cool slightly before removing from foil. Once cooled, remove from foil and set aside. When ready to use simply squeeze the whole head of garlic with your hand, turning the top upside down while gently pushing out the softened garlic. In a large saute pan, cook the 4 bacon slices until crisp. With a slotted spoon remove the bacon strips from the pan (reserving the bacon drippings). When cool crumble the bacon and set aside. Add 1 tbsp of the reserved drippings back to the pan (saving the rest of the drippings for the warm bacon vinaigrette) along with 1 tbsp olive oil and place on medium high heat. Once heated, add the chopped onion and saute for 1 – 2 minutes, just until onion begins to soften and becomes slightly translucent. Reduce heat to medium low and continue cooking the onions, stirring occasionally, for another 5-8 minutes, until very soft and translucent, being careful not to brown the onions. Add the chopped tomato, roasted garlic and salt. 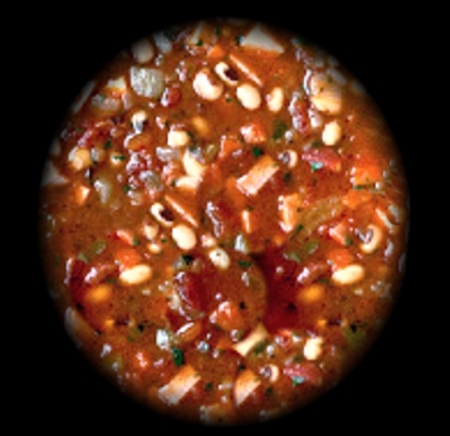 Continue cooking for 20 minutes, stirring occasionally, allowing the tomatoes to cook to a very soft consistency. Place one prepared cabbage leaf on a flat surface and place the smoked oyster filling (about 1/4 c) onto the bottom third of the leaf, spreading out to within 1/2″ of each side of the leaf. Begin rolling the leaf away from you, tucking the sides onto the roll as you go. Once rolled, place seam side down in a greased 9×13 pan on which you have spread a thin layer (about 1/4 c) of the roasted pepper puree (recipe follows), repeating with the remaining cabbage leaves until you have 8 cabbage rolls. Lightly sprinkle the tops of the rolls with a few drops of water. Cover the pan with foil, place in a preheated 325 deg F oven and bake for 40 minutes. Remove from oven, leaving covered while preparing the warm bacon vinaigrette (recipe below). In a blender or food processor add all of the ingredients and process until smooth. Place in a bowl and set aside until ready to use. This makes approximately 1-1/4 cups of puree. In a small bowl mix together the rice vinegar, honey, dijon mustard, and dash of black pepper. Microwave on high power for 1 minute. Remove, stir in the crumbled bacon, then briskly whisk in the bacon drippings and olive oil. Serve immediately. Place approximately 1/4 cup of the roasted pepper puree onto the plate. Arrange two of the prepared cabbage rolls on top of the puree. Drizzle the warm bacon vinaigrette over the top and serve.